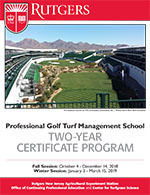 Work towards your dream job in turf by earning a Two-Year Certificate from the Rutgers Professional Golf Turf Management School. Attend two 10-week classroom/field training sessions, work during the 9 months in between and leave with the credential you need to earn more. Learn the basics of turfgrass science and golf course maintenance in the Rutgers Professional Golf Turf Management School's Three-Week Preparatory Course. Whether you are new to the industry or just need the education to match your experience, this course will help you reach your goals. The Ralph Geiger Turfgrass Education Center, located on this farm, is one of the classroom locations for our turfgrass management programs. Click on the image below to download PDF.